“Eat your vegetables, or you won’t get no dessert!” was a slogan for a local Anchorage restaurant when I was growing up. It became a mantra in my household. My dad still says it occasionally when I take my children to his house for dinner. We all know we should eat plenty of vegetables, but many parents have a hard time getting their kids to eat one serving of vegetables each day, let alone “plenty.” Parents often end up begging, bribing, bargaining and even forcing their kids to eat them. Are these tactics really necessary? Is there an easier way? Here are some tips to not only avoid the battle but get your children to enjoy their vegetables. In order for your children to actually eat vegetables, parents need to be a model for good behavior. The old adage “Do as I say, not as I do” won’t work here. “What you want to do is provide healthy choices – and deep-fried foods are not healthy choices,” notes Bret Luick, PhD, nutrition specialist at the University of Alaska Fairbanks Cooperative Extension. Show them you love eating vegetables, and your children will follow suit. Scale back on everything else. By providing lower-calorie foods as the main course, kids will turn to veggies to help fill them up. Luick says not to worry; your children will still eat the same amount of calories and keep growing. If calling that stalk of broccoli a “strong and mighty tree” isn’t getting your little one to open up, change the way you present it. Try cutting vegetables, like red peppers, with a cookie cutter. You can do the same thing by mashing vegetables, cooling them, then using the cookie cutter to shape them. Think dinosaurs or kittens for your picky eater. The American Dietetic Association suggests leaving vegetables and fruit where kids can see them. It’s that simple. If kids can reach it, they just might eat it. Leave fresh, ripe fruit on the counter and bagged fresh veggies at eye level in the fridge. Many children will happily snack on raw veggies when they won't touch that same cooked veggie at the dinner table. Consider placing a plate of raw cut-up veggies on the dinner table every night – yes, carrot sticks, but also sweet red peppers, peeled cucumbers, celery, fresh peas and tomatoes. Many kids who don’t care much for vegetables will eat them up if they can dip them. However, Dr. Luick discourages offering high-calorie dips, like ranch dressing. Consider lower-fat options such as hummus, salsa and yogurt-based dressing. Different textures appeal to different children. Raw vegetables appeal to some children, while al dente (slightly firm) or well-cooked vegetables may appeal to others. If your child has issues with the textures of vegetables, preparing them differently can make a world of difference. Simple preparation is healthier, but if all else fails serve cooked vegetables with small amounts of sauce made from whole-wheat flour, low-fat milk and low-fat cheeses. Get your child involved in buying vegetables at the store or the local farmers market and deciding what vegetables to eat with dinner. Also, ask them to pick a veggie to add in to one of their favorite dishes. “Having kids involved with food production gives them an intrinsic interest in the foods,” says Dr. Luick. He suggests helping children with a window box or garden. If your child won’t touch a veggie with a 10-foot pole, start by making them “invisible.” You can puree or shred vegetables and stealthily slip them into your kids' favorite meals. Hide carrots in meatballs and muffins. Conceal cauliflower in mac ’n cheese. Tuck zucchini in spaghetti sauce or even brownies! Involve your children in the cooking. They can chop vegetables with a butter knife or break them up into pieces. Even if it is something as simple as washing the veggies or arranging them in a pretty way on the platter, it's amazing what foods kids will eat if they feel they have prepared it themselves. Let kids decorate their own mini-pizzas with different veggies. Lay out a display of toppings such as tomatoes, mushrooms, shredded carrots and peppers. If they make it, they’ll eat it. Don’t make the kids pick things out of their food they don’t like. Research shows that foods taste differently to children than to adults. Instead of steaming green beans and onions together, add the onions when kids are a little older. “Oh boy, we get to have cabbage tonight!” If you get excited, so will they. 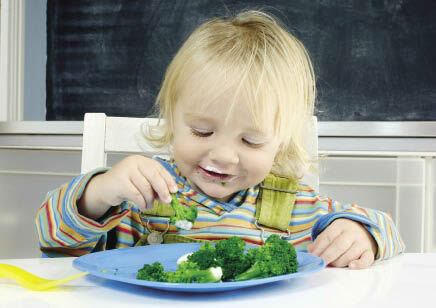 What are some tricks and tips you have for getting your kids to eat more veggies? Please share! Post advice and recipes on our Facebook page at www.facebook.com/alaskaparent.